As I was still watching the mother and her son leaving, I remembered! A few days ago, our kids played together, chasing each other and laughing. When my son found a stick, he started to poke a tree root with it. Next, he poked it with his fingers, trying to figure out if it was another stick he could pick up. Soon enough his little hands were covered in dirt. The other little boy came closer and he wanted to join in the fun. My little one offered him his stick, but the mother intervened: “Oh, no! I don’t want him to play with dirty things!” There were tears, but that is not the point here. My understanding was that this parent was worried her son will want to play again with my son and she didn’t want him to get upset because she won’t allow him to get dirty. I felt really bad for being perceived as a bad influence. What is so bad about dirt afterwards? Why are so many people repulsed by it? Rupophobia (fear of dirt) is a serious condition and I believe it can come from being often told that you are dirty or not to get dirty. It is understandable that we are careful about what our children play with and where, but on obsession with cleanliness can lead to fears in our children and ourselves. If we are afraid, our children will take over our fears. Comfort is another reason why we want to stop our children from getting dirty. We don’t like them to ruin their clothes. Those stains! *Messy play means free, creative, undirected, unstructured play and exploration to me. We have to remember that young children need to explore their environment with all their senses and that they learn through play. Every day is a new adventure in the environment, with everything that is new and interesting. When parents limit the exploration, children get frustrated and have behavioural issues. Sometimes they refuse to go to sleep, and other times they say NO to everything. They still want to explore and they don’t want to miss out on the fun of simply being in this exciting world around them. They are not being oppositional, they just have a strong exploration instinct. The lack of exploration will determine a child to prefer familiar situations and be afraid of the unknown. Messy play will teach kids that every new situation is a challenge. When playing freely, children will find creative ways to look at/to solve problems. If it gets messy, and it does, the richer the textural experiences, the richer the cognitive and language development of the children will be. In their play, children can master emotional issues such as anxiety, frustration, normal developmental conflicts, traumatic situations, unfamiliar concepts, and overwhelming experiences. Exposure to bacteria early in our lives is an essential step in developing a healthy immune system, according to researchers. In fact, adult immune systems remember the germs they have been exposed to since they were young. That doesn’t mean you should give up on routine hygiene, but going overboard with hand sanitizer and cleaning products, however, may not be doing you any favours. Our children build resistance against diseases and allergies if they get dirty. Either is gross motor skills or fine motor development, play is the key to a good physical condition. 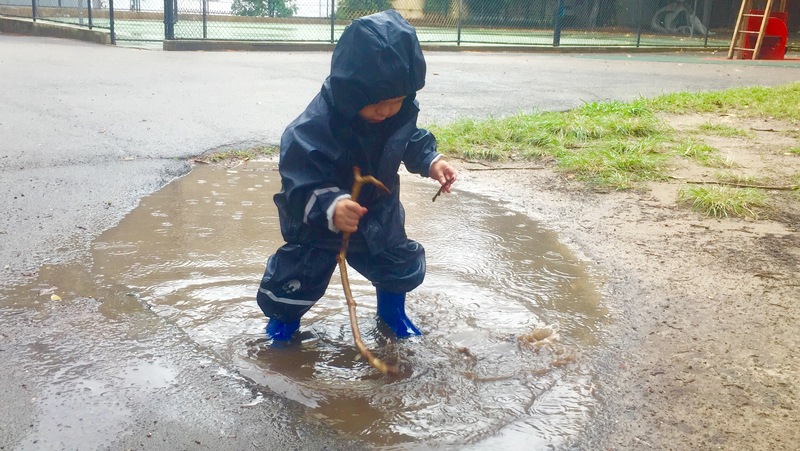 Running, skipping, climbing, kicking, painting, mimicking writing in the dirt, sand and water play, woodworking projects, play dough, are a few examples of play activities that promote motor development. Don’t hold back! Just go outside and play! I’ll let you be the judge of the second video I have found! Next time your children make mud pies, surprise them and get your hands dirty with them. It’s so much fun!